The software is nice looking and fairly flexible in customization. 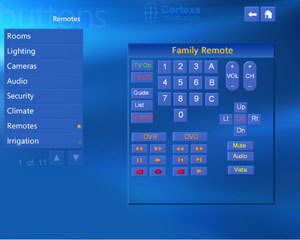 Below are some screenshots of typical screens that might be used to control systems throughout the house. 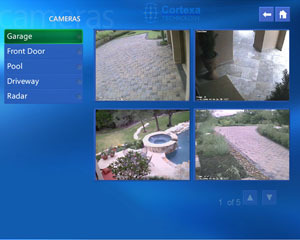 The Cortexa can be controlled from many locations and devices. 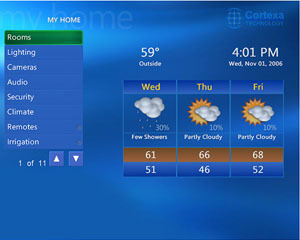 They make a really nice in-wall touch screen panel, but it's also possible to control the Cortexa from a desktop, PDA, tablet PC or even over the internet via Internet Explorer. Soon I will be using a tablet PC (on a stand) sitting on the kitchen counter and a Dell Axim with wi-fi as my mobile "remote control". The client software looks and operates about the same on all the platforms and seems to shrink or expand to fit the available screen size. 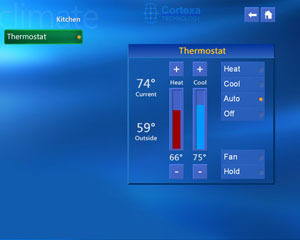 Cortexa Technology currently makes four different models of their home controller. All four models come in the same enclosure and they all provide nearly the same functionality. The difference between the models is the number of serial ports included and whether or not analog video cameras can be connected to the unit. The base unit comes with four serial ports, which means you can control up to four serial sub-systems (maybe thermostats, X-10 lighting, irrigation and a security system). The 7202-V model comes with an expansion card (integrated video server) that allows the Cortexa to interface with up to four analog video cameras. The video server expansion card can be seen installed in one of the two expansion ports on the back of the Cortexa. The "base" model and the "video" model can both be expanded with four additional serial ports, for a total of eight serial ports. Since most sub-systems connect via serial port, you'll want to consider all of the device types that you plan on controlling. If you plan on connecting more than four sub-systems to the Cortexa you will probably want to order a model with the serial expansion. For example, If you plan on using Insteon for your lighting control and X-10 for other devices, thermostats, security system and irrigation, you're already at five serial-connected systems and you'll need the additional serial ports.